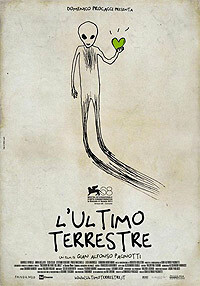 L' Ultimo Terrestre (2011) - Sci-fi-central.com. Italy  2011  100m   Directed by: Gian Alfonso Pacinotti.  Starring: Gabriele Spinelli, Anna Bellato, Luca Marinelli, Teco Celio, Stefano Scherini, Roberto Herlitzka, Paolo Mazzarelli, Sara Rosa Losilla, Vincenzo Illiano, Ermanna Montanari, Ugo De Cesare, Nicola De Paola, Francesca Rosa.  Music by: Valerio Vigliar. The story of the latest week on the earth before the announce of the landing of an extraterrestrial society on earth seen by the eyes of a misogynist man with only the desire solitude and routine. I saw this film as part of the Rotterdam Film Festival 2012. It has no logical story line, no moral and no clear happy end. Yet it is entertaining for the whole duration, with absurd dialogs and even more absurd turns of events. The tone is set during the opening credits, where we listen in on a radio reporter answering phone calls from people with the utmost idiotic opinions about an imminent invasion of aliens. The latter appearance in the sky forms the trigger for the rest of the story. The story goes on by following our main character (Luca) visiting a "professional lady" (that is what she calls herself) in an even more absurd settings of a furniture showroom. And I could go on endlessly with recalling subsequent events, rolling over each other with only a skeleton story to tie them together. But still, it is much more than a series of sketches, so read on. The word "drama" in the announcement loosely relates to something that happened in Luca's youth between his father and his mother. It should serve to explain Luca's non-existing relationships with women, but psychology as a science is stretched to the limits here. It does not matter very much, since all other things that happen in this film are not very scientific either. We get to see some aliens, with sub-standard appearance, of which I can only say that they look "traditional". The aliens are smaller than us, but with relatively large heads and large eyes to compensate. Apart from seemingly having mysterious powers to cure people, any other technical or mental abilities remain uncertain. We don't see any high-tech devices, and we don't even know they have some. All in all, undeniable entertainment for the full 95 minutes. Do not expect a consistent plot, for you won't get one. It is not memorable for years to come, but it has no such pretenses. Review by JvH48 from the Internet Movie Database.